For years I've heard great things about Enix's Star Ocean series. While I've always loved the traditional Final Fantasy and Dragon Quest games, I'm always hearing from the small cult of Star Ocean fanatics that tell me that I'm missing out. They may be right, but based on my experience with this updated PSP remake I'm still trying to find what it is that makes everybody so excited. Sure the game has its moments and the combat is intriguing to say the least, however this first installment gets bogged down by too much backtracking and a slow and tedious story that doesn't go anywhere until the end. 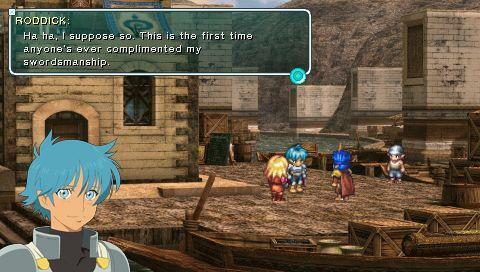 For what it's worth, this is the first time the original Star Ocean has been released in North America. Originally released on the Super Famicom, this 1996 role-playing game came out just a little too late to be translated for American audiences. 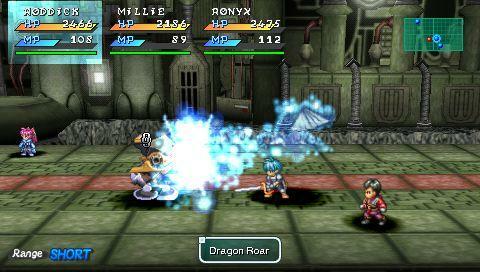 Now known as Star Ocean: First Departure, this PSP remake features updated graphics, a slightly tweaked combat system and some breath taking cinemas. The introduction feels like it's right out of an old Star Trek episode, which gave me great hope for this 12 year old adventure game. The story revolves around Roddick, a simple country guard who is in search for a cure for what is making the people of his world sick. Unfortunately he can't quite get to that vaccine and feels like an absolute failure. But wait, two Earthlings show up and tell him that the only way to save his world is to travel into the past and find the vaccine there. Sure the plot seemed kind of campy, but I was on board with the idea of time traveling and saving the world. 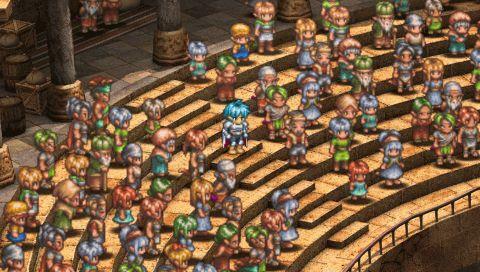 We saw how well that worked out for Chrono Trigger, so it stands to reason that Star Ocean would be just as awesome, right? Oh how wrong I was. Instead of having a heartfelt story of regret, loss and revenge, we get a bland story where all you're doing is going from one town to the next in hopes of doing the right thing. For the most part you're stuck just wandering around a bunch of boring islands looking for something to do, but there really isn't much for you to do. At the end of the day you're going to spend hours trudging through one of the least compelling role-playing stories I have ever seen, only to get wrapped up in a rather interesting final act. The problem is, getting to that final act is a real pain, the kind of pain most adventurers are going to give up on long before they get there. 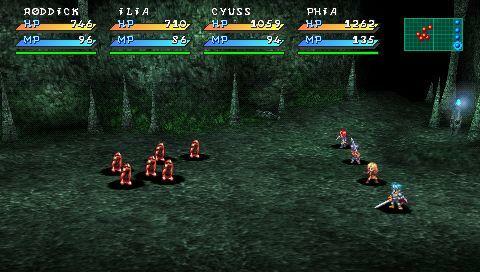 One of the biggest problems with Star Ocean is the fact that there's never anything interesting to do. Even when you know exactly what it is you're supposed to do, doing it isn't as much fun as it sounds. There aren't many side quests, so all that is left for you is the main (boring) quest and just running around killing bad guys. Even the various locations you travel to aren't much fun; they are basically wide open worlds where nothing much happens. This isn't like one of those Final Fantasy worlds where everything feels like it's there for a reason, instead Star Ocean's world seems thrown together at random. The developers (Tri-Ace) knows they need to have a certain amount of open area and a few towns scattered about, but outside of that there isn't much else to see. Another problem is that half the time you don't really know what you're supposed to do. Even when I was reading every conversation and paying close attention to the story, I still found myself lost not knowing where to go next. Sometimes it's as simple as talking to a guy next to a boat, but often times you'll have to find just the right person in just the right town. This little problem only gets bigger when you find yourself backtracking to the towns you started in. There was one moment in the game where I found myself back on the original island I started on completely confused as to what I was supposed to do. Lo and behold, what I needed to do was travel to a completely different island, talk to a shop owner and then travel all the way back to that first island and talk to somebody else. That was my mission. Even though I was paying close attention, I don't remember anybody saying anything about that shop owner, and the fact that I'm having to go back and forth is obnoxiously annoying.Speaking of annoying, I quickly found that Star Ocean's combat wasn't quite at the same level as many other 16-bit role-playing games. The combat is simple; you control one person while the computer controls all of the other people in your party (up to three other people). As that one person you rush into a real-time battle mashing buttons to clobber the bad guys until they die. If you need to heal you can pause the action and pull up your items menu. The magic/special abilities is mapped to your two shoulder buttons, so each character is limited to only a couple of big attacks. For the first half of the game I didn't even have to think about using items or magic, I could just rush in and power my way through the various bad guys. You aren't forced to play as any one character, either. You can switch between the characters at any time; however you'll quickly realize that the computer isn't as good at controlling their actions as you are. I longed for a turn-based system that allowed me to control everybody, or at least point the people in the right direction. Too often the computer-controlled characters go off and do their own thing and waste magic when they shouldn't. Outside of fighting random battles and backtracking there isn't much else to do. You won't have a lot of side missions to accomplish, so your only real option is to keep plugging away at the main storyline. But that storyline is just too boring and frustrating, especially when you're constantly having to backtrack for no good reason. To make matters worse, when you backtrack you're forced to fight random battles with enemies that are pushovers given how powerful you are now. In fact, that's probably the biggest problem with the game - it's just far too easy. Outside of a few battles, chances are you won't run into much difficulty as you make your way to that mythical vaccine. Couple the easy difficulty with the boring story and tedious gameplay and you have a role-playing game that doesn't have much going for it. On a bright note, the game does look a bit better than it did on the Super Famicom. Mind you, this doesn't look significantly better, but you can easily tell where Tri-Ace went in and updated it. You still play a simple 2D sprite, but for the most part that isn't that big of a deal. The game's backgrounds aren't bad, but they are a bit inconsistent. Oddly enough, the game likes to switch graphic styles a lot. 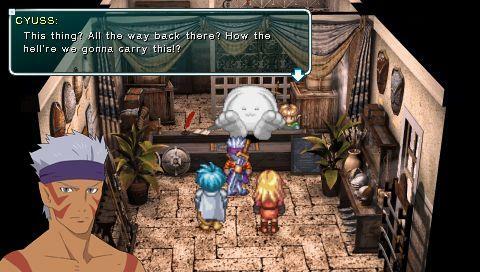 For instance, there are times when you are an enormous sprite walking over the game's world map. 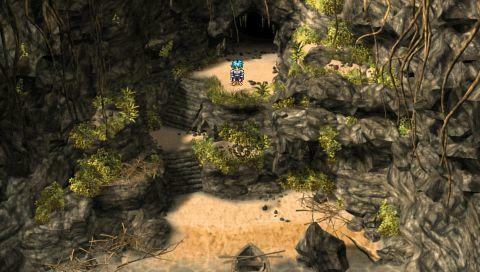 Yet at other times you are a small sprite walking through pre-rendered set pieces (a la Final Fantasy VII). And then there's also a weird in between style that is used when crossing bridges and going through the mountains. Changing from one to another is rather jarring, and outside of aesthetics I see no reason for them to keep shifting the styles. Thankfully the game's cinemas and music is here to save the day. The all too brief anime-influenced cinemas are a real wonder, and I had a great time looking at each and every one of them. 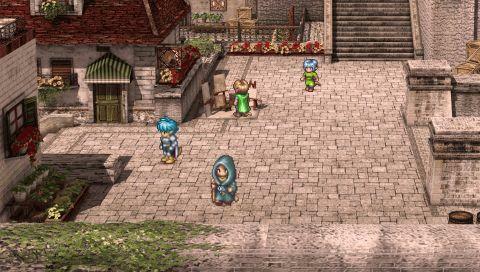 I also loved the music, which takes classic Star Ocean music and remixes it. There is voice acting, too, but that isn't nearly as entertaining as the music and cut scenes. It's not that the voice acting is bad, per se. They just don't have a whole lot to work with. The dialog borders on the inane and is often mind-numbingly melodramatic. Worse yet, there are a lot of times where you actually have to wait for the people to talk, slowing the already sluggish story down even more. 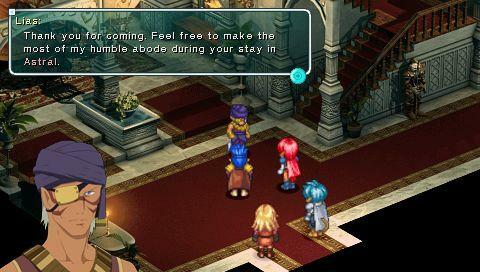 I really want to like Star Ocean: Fire Departure, but I found the story just too boring to stay interested. I also didn't care much for the main characters, hated the button mashing combat and couldn't understand why I kept getting lost in such a small world. I'm sure there are Star Ocean fans out there that consider this to be one of the greatest role-playing games of all time, but I'm not seeing it. I can only hope that things pick up a little more with the sequels, specifically Star Ocean: Second Evolution, which is due out in January of 2009. 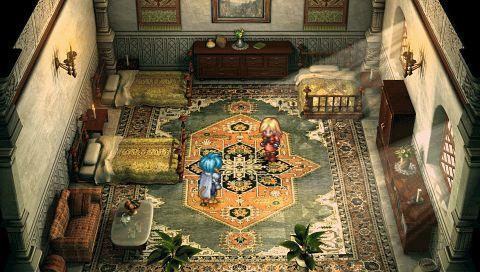 If you're looking for a new PSP adventure game based on a Super Famicom game that never came to the U.S., then Star Ocean is the game for you. Just remember to pack a lot of energy drinks, because the lame story and backtracking is enough to put you to sleep. 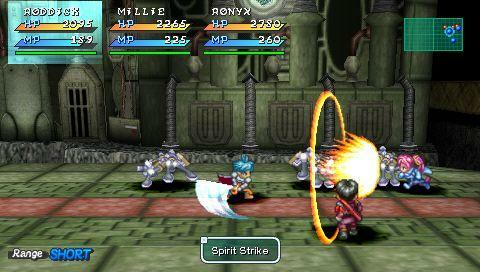 This original Star Ocean never came out in the U.S., and judging by this PSP remake I'm starting to understand why. With a weak story, repetitive gameplay and a little too much backtracking, it's easy to become indifferent to Square Enix's newest portable role-playing game. That's not to say that the story doesn't pick up towards the end, but most people will have tuned out long before anything truly interesting happens in this game!